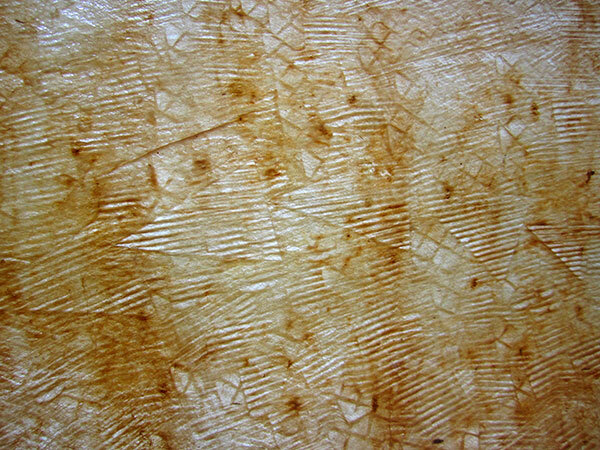 Te Rangi Hiroa (Peter H. Buck) writes in Arts and Crafts of the Cook Islands that the tapa makers of the time (1944) wrapped the pre-beaten bark in banana leaves and left it to ret for three days. 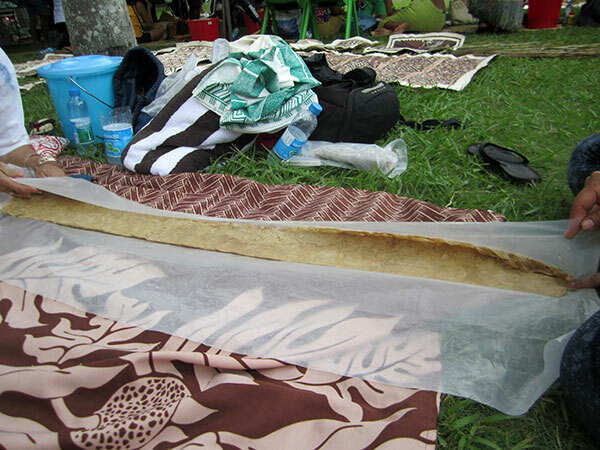 Today’s tapa makers on Atiu usually beat the bark right away. 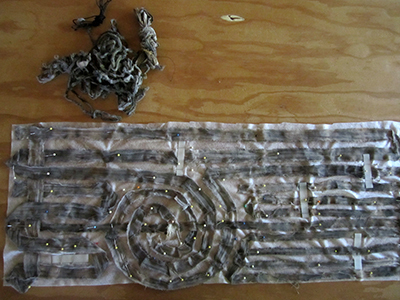 When making a larger piece such as a garment, several strips are joined together with glue. 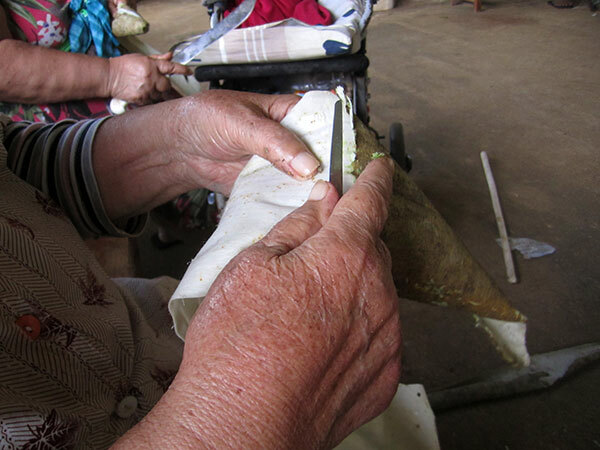 In times past, retting, a water-aided fermentation process, loosened the fibres and enabled the tapa makers to join the pieces together by a kind of felting (beating). 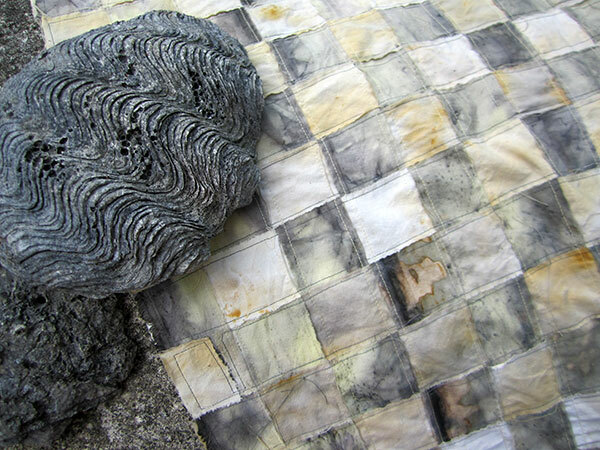 Following a correspondence with Hawaiian kapa maker Dennis Kana’e Keawe, at the Atiu Fibre Arts Studio, at the Atiu Fibre Arts Studio we conducted a number of experiments in 1988/89 to try this method. 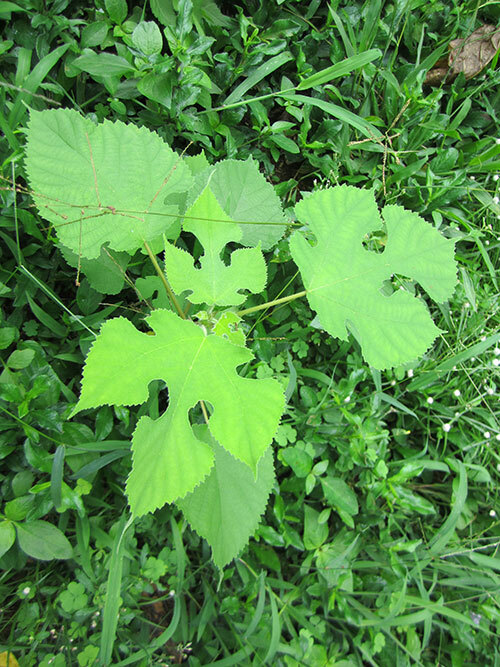 He joined us in beating the prepared bark. 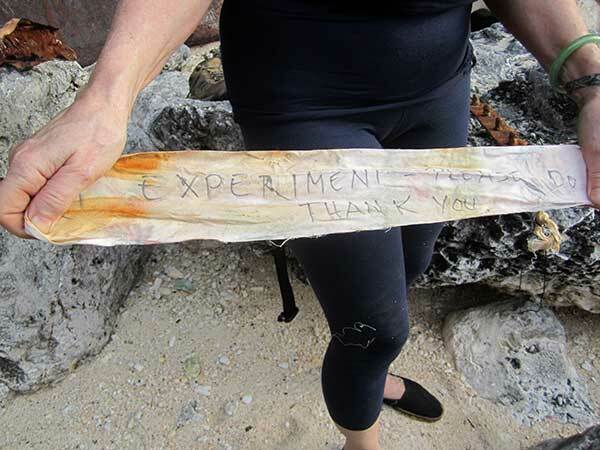 In 2013, I agreed with the art teacher at Enuamanu School to repeat the experiment. 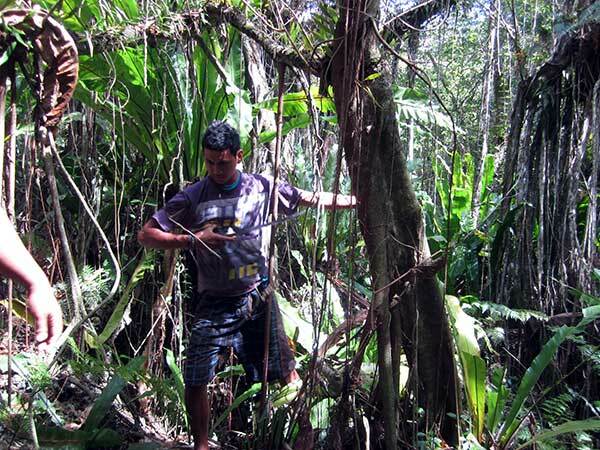 Atiu does not have running streams and water shortage is often a problem. However there is one particular beach, Avatapu, the beach on which the Edna was stranded, that Atiu women use to ret lemon hibiscus bark for making dancing costumes. That’s where, in 1989, we soaked our shaved bundles of banyan roots instead of heating them to enable us to get the bark off the wooden core. 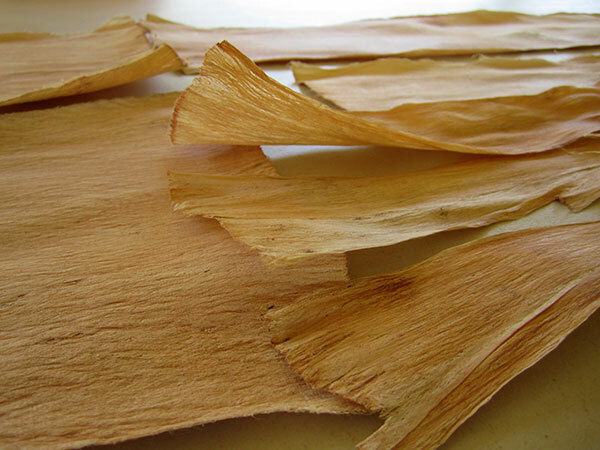 This process both softens and loosens the bark and preserves it at the same time. 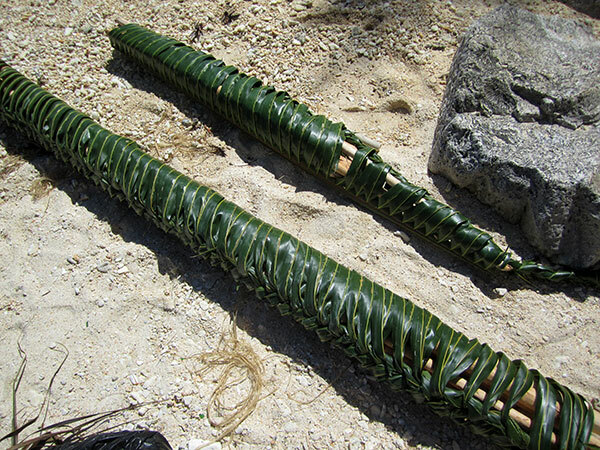 In 20213, the art students came up with an ingenious way of insuring that the bundles would stay together, by plaiting a coconut frond around the bundle. 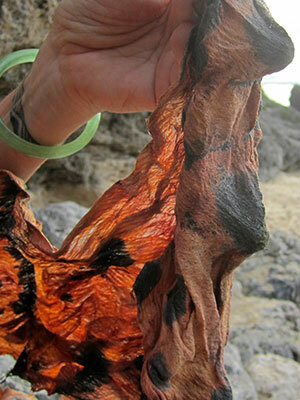 Heavy boulders of coral have been thrown up on the beach’s edge at Avatapu. These serve as weight to keep the bundles submerged in the water and in place when the sometimes rough sea tries to steal them away. 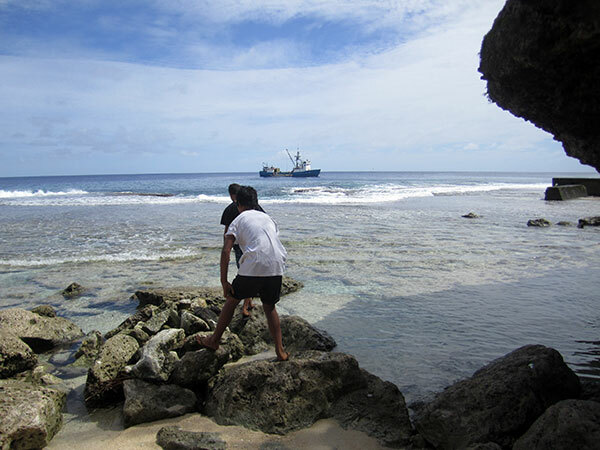 The beach is right next to our harbour and the cargo boat that brings cargo from Rarotonga to the sister islands had arrived that day. I am not sure whether it was light or salt water – or the absence thereof – that caused the basket’s pattern to be imprinted on some of the outer roots’ bark. Worth conducting more experiments to find out how I can achieve that purposely, I guess, but not right now. The bark we have removed gets rolled up in leaves and is left to ferment. 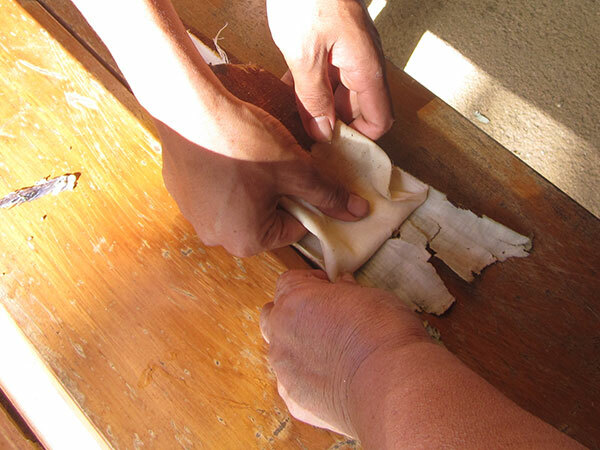 Fermenting their paper mulberry bark is a distinctive feature of Hawaiian kapa (their word for barkcloth). 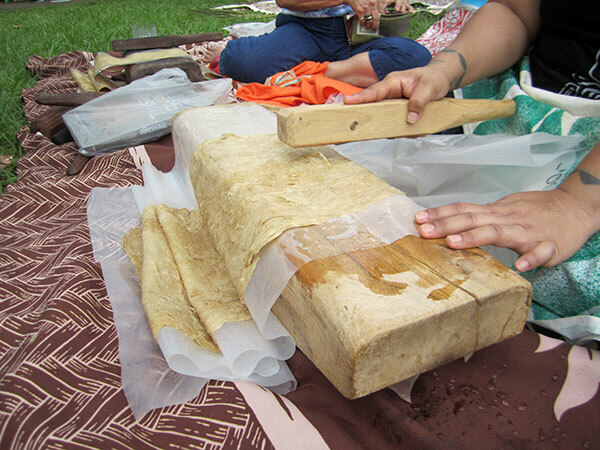 During the Tahiti Tapa Festival in 2014, Honolulu tapa expert Moana Eisele and her assistant, Kamalu du Preez, demonstrated to us their innovative method. 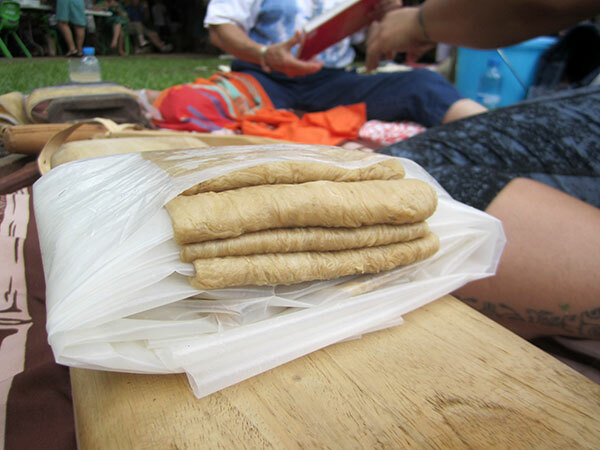 Fermented wauke (Hawaiian for Broussonetia papyrifera or paper mulberry) becomes very delicate to work with. Especially when you plan to make a wider sheet, moving it forward on the kua (Hawaiian for wooden anvil) can be quite a challenge. Moana therefore beats her kapa on a large sheet of plastic. 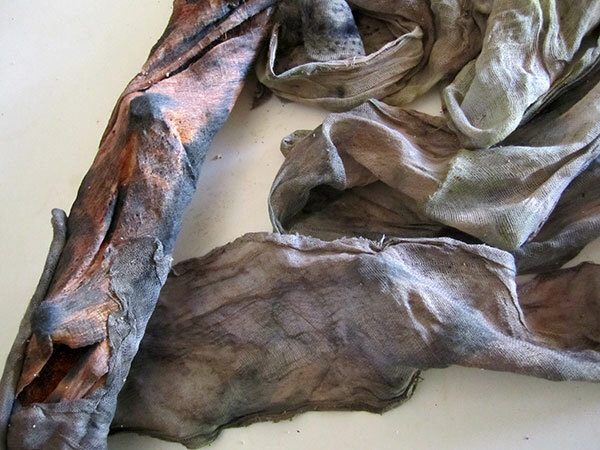 …and if she wants to keep an unfinished piece for another beating session the next day, it is ideal for storage, prevents the bast from drying out and might even keep it fermenting. 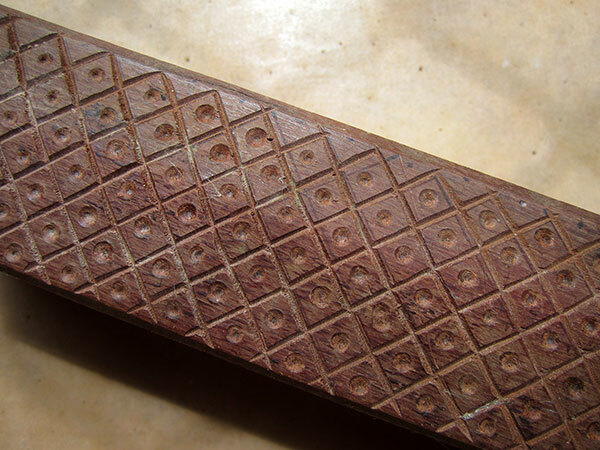 Hawaiians have patterned i‘e kuku (tapa beaters) with which they can ‘imprint’ a watermark into the moist bark that has been finished beeting into a fine sheet. 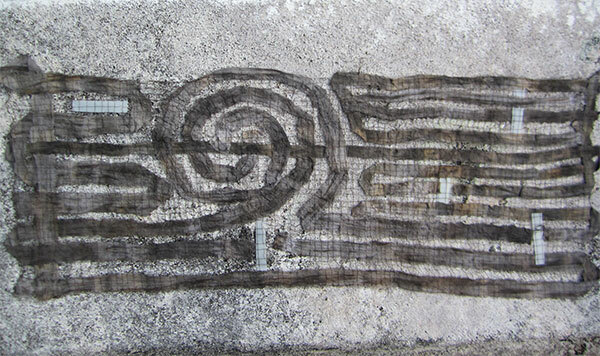 Our Hawaiian friend Kana’e gave us a beautiful i’e which he had carved himself when he visited the Atiu Fibre Arts Studio in 1989. I love working with it, because it is well-balanced and wonderful to handle. 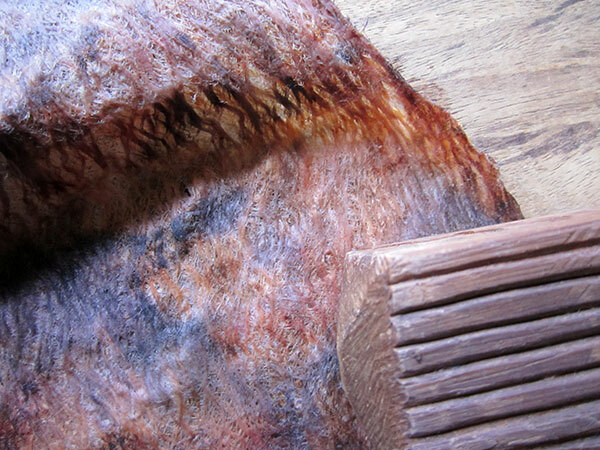 I used it to experiment with a small piece of mati (ficus tinctoria, dye fig). I had also put some triangular pieces of cardboard between the tutunga (wooden anvil) and the bark to try out some different ways of watermarking. As we can see here, it worked. 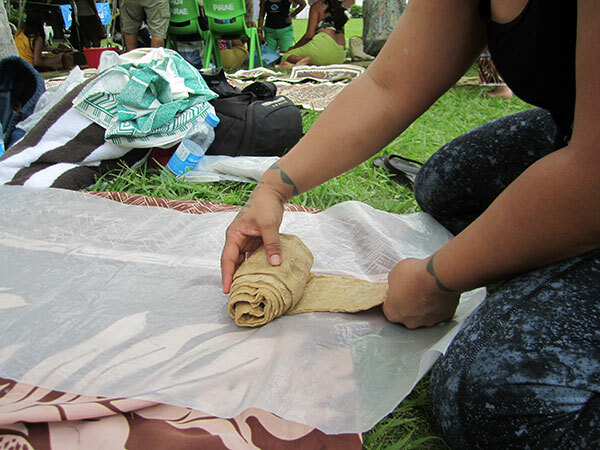 From questions following my earlier post I can see that there is a need to explain how we on Atiu make anga (the Cook Islands word for barkcloth or – as it is commonly known – tapa). 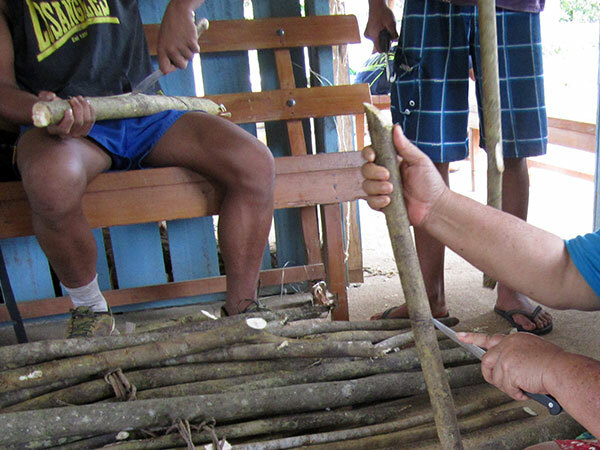 Thanks to the taunga (experts) of our island and the teacher and senior art students of Enuamanu School, during a special workshop in 2013 I was able to shoot these detailed photographs that now help me to illustrate the process. On Atiu, paper mulberry (Broussonetia papyrifera, which our people call aute) is nearly extinct. 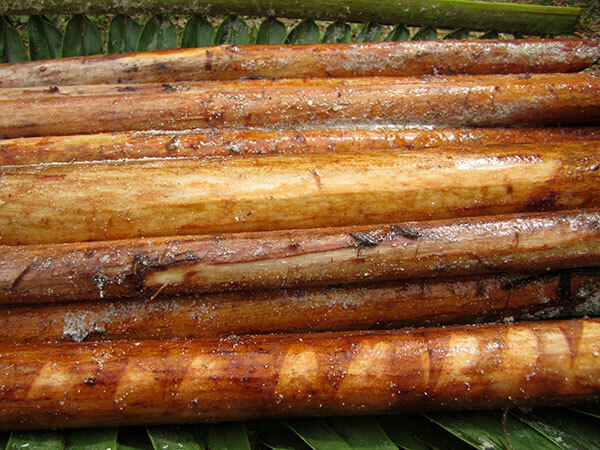 Our people use the inner bark, also called bast, of the aerial roots of the banyan (ficus prolixa, on Atiu called ava), stems and branches of breadfruit (artocarpus altilis, CI Maori kuru), and dye-fig (fictus tinctoria, on Atiu mati) instead. 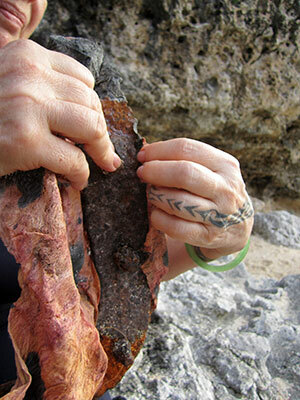 Since banyan and dye fig trees grow wild on the island’s raised fossilized coral reef, harvesting is not an easy task. 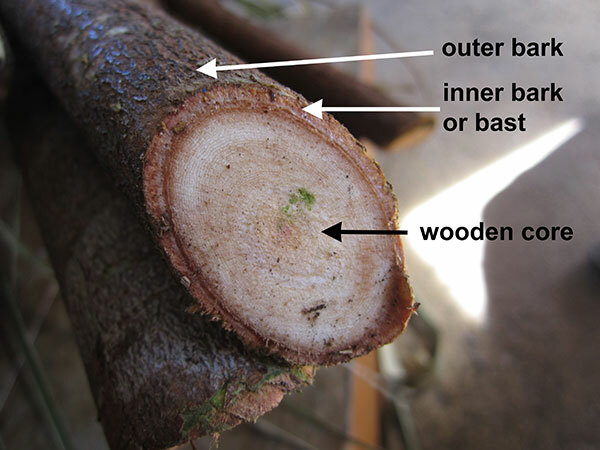 In this cross-cut of a banyan root we can clearly distinguish the white wooden core and the thick layer of bast that sits under the thin outer bark. It is the bast that gets beaten. 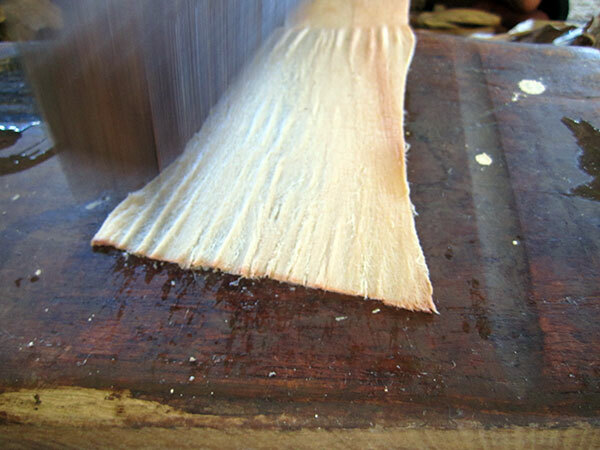 Raw banyan bark cannot just be pried off the wooden core like most other barks can. The roots therefore need special preparation. 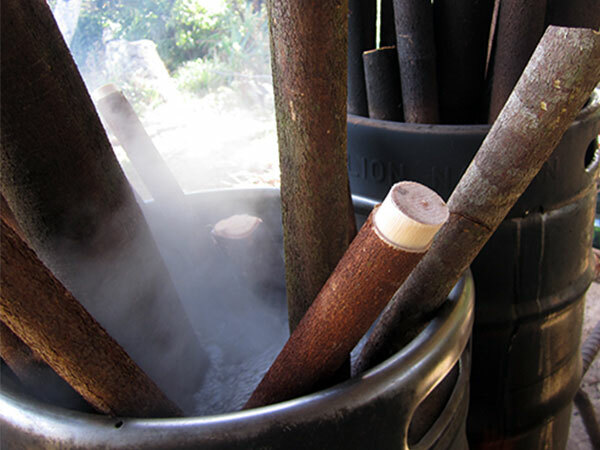 The most common way, if you only need short pieces of bark, is to boil the sticks in water. 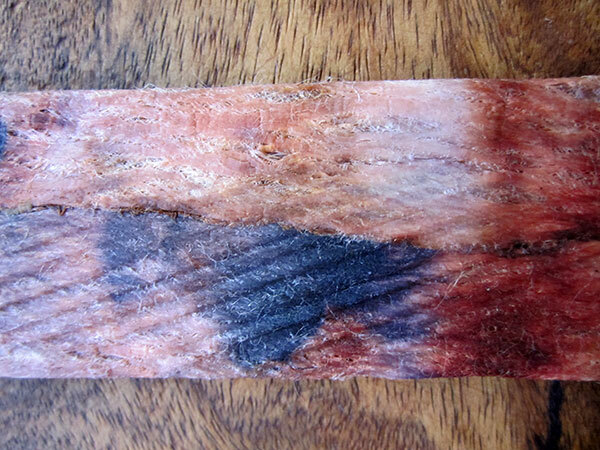 The heat eventually shrinks the bark away from the wood and thus makes it easy to get it off . Longer roots can be carefully heated on an open fire, or steemed in an earth oven to achieve that same effect. 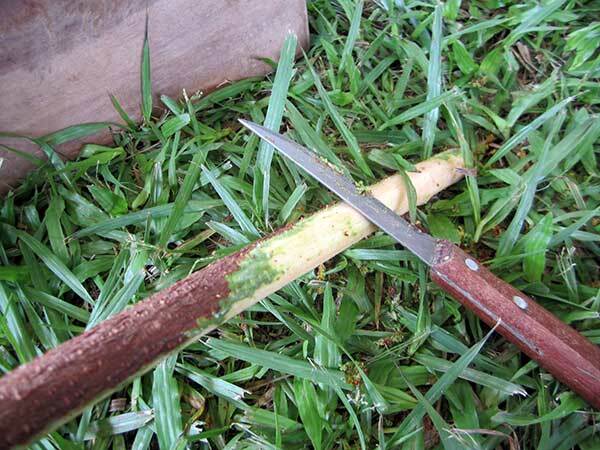 The bark of the stem/branch/root is cut lengthwise to peel off the bark. In the photograph we see dye fig specimens. 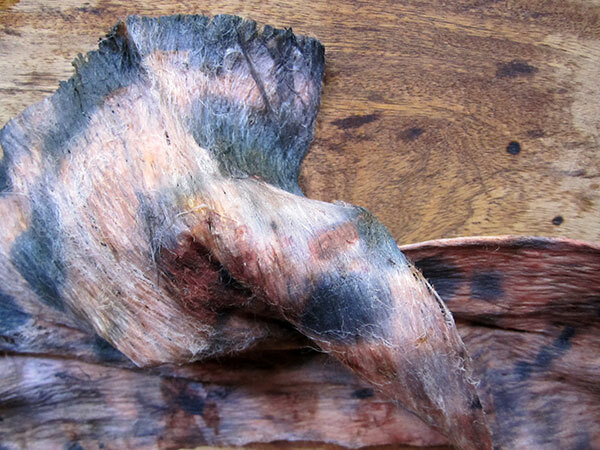 …before it can be torn off the inner bark, much like skinning an animal. This is best done with someone else’s help and requires strength and skill. 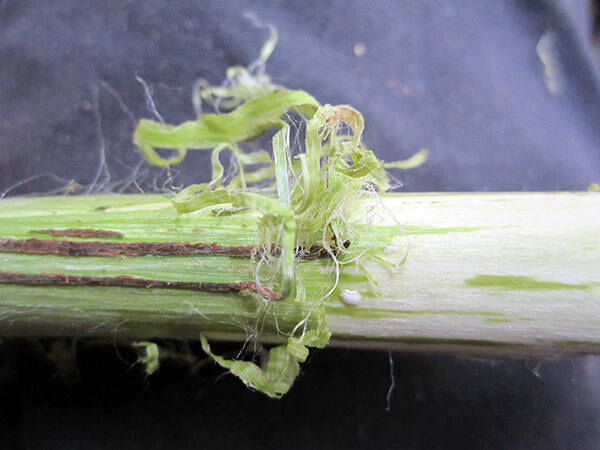 …but to carefully scrape it off until all the green matter is gone and the white bast is revealed. 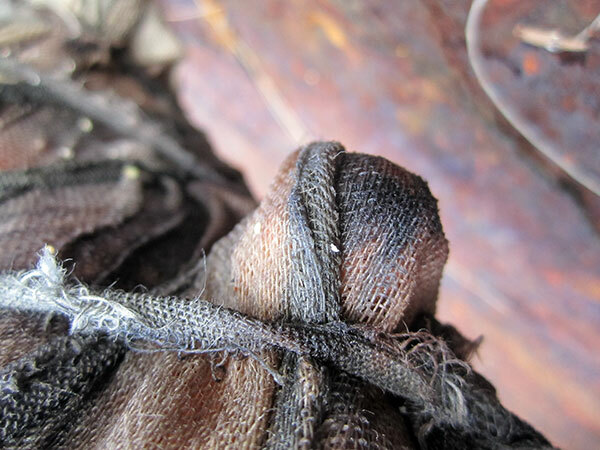 The more bast there is, the wider my finished cloth can be. 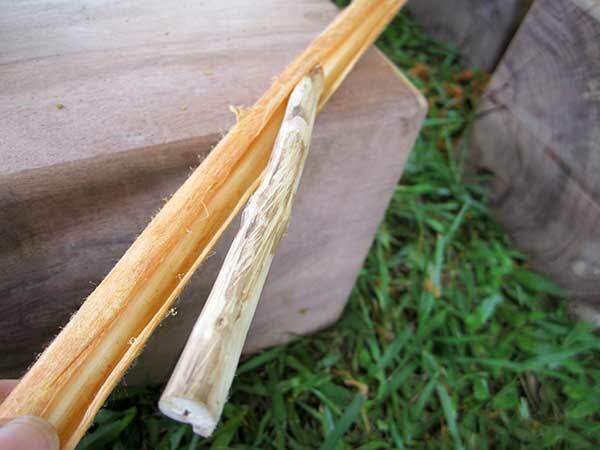 Sarah used a clever tool, a stick of guava wood, which is very hard, with a diagonally cut end. This helped me to pry off the bark. It looks so easy when experts do it, but I had to be very careful not to damage the bark in the process. The bast is washed, kept moist and can then be processed further. 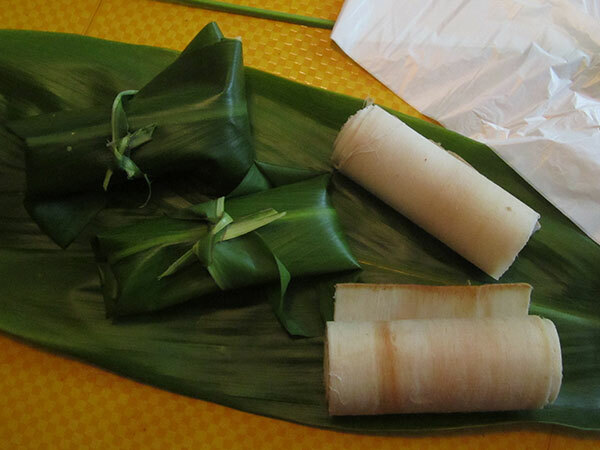 For storage, it is rolled up inside out, wrapped in ti leaves (cordiline terminalis) or banana leaves and, gathered in a plastic bag, it keeps well in the freezer until it is needed. In less humid climates or places with air condition, if can also be dried for storage. 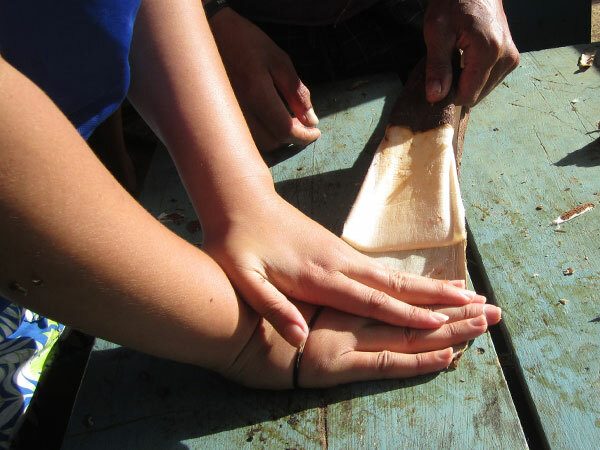 The fresh bark can be beaten directly. 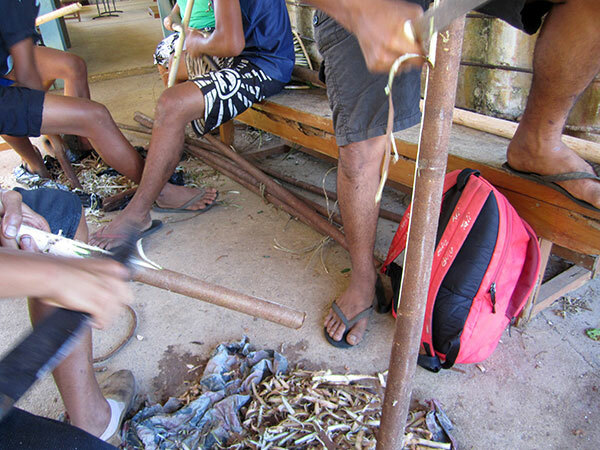 On Atiu we use square hardwood beaters, called ike, which have four different sides with length-wise incisions. 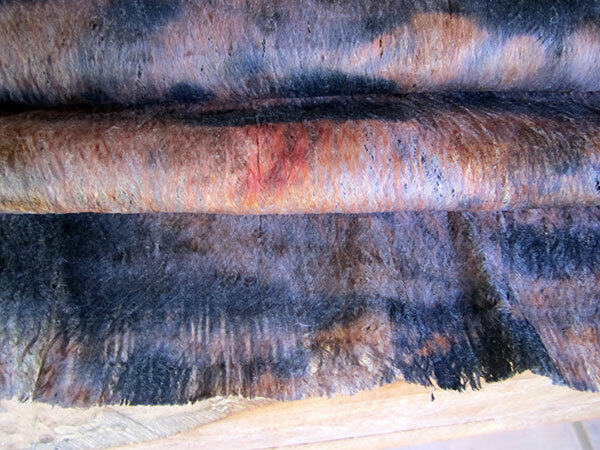 The side with the widest ridges is used for the first breaking open of the fibres and softening of the bark. 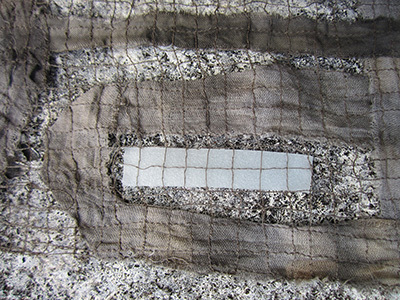 As the bark grows, the sides with the narrower incisions are used and the beating becomes gentler to insure that the resulting cloth gets a smooth and even surface. 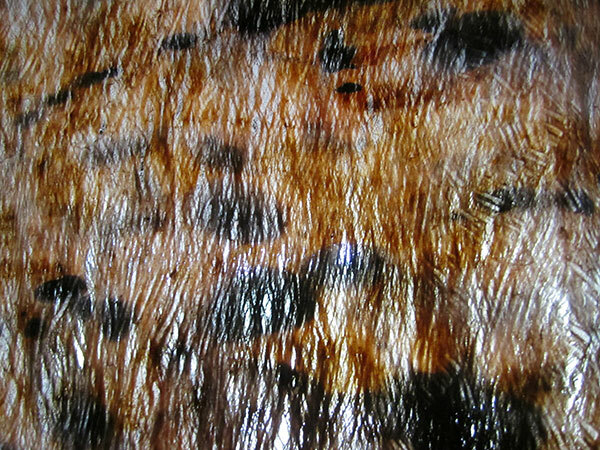 Once the bark has been beaten evenly throughout and has reached its largest possible with, it is spread out flat to dry. Exposing it to the sun will darken and harden the bark. That’s why I prefer it to gradually dry in the shade. 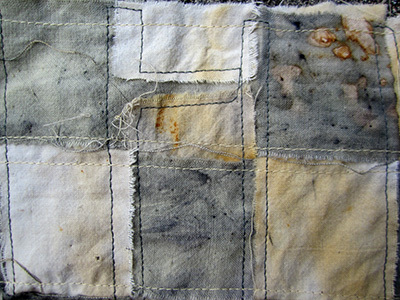 It is important to keep finished tapa dry so that it doesn’t get mouldy, so airing it from time to time is a good idea. For special projects and a much smoother bark to work with, it is necessary to go through some more preparation before the beating process can begin. I will write about this my next post. At the very end of our coffee plantation, right next to the bananas and near the underground stream, Juergen has planted my three paper mulberry plants from Rarotonga. After a year and a half, I decide that they are old enough to harvest. What I really hope is that after harvesting, the plants will produce new shoots and that way I can eventually get a small plantation growing. There are beautiful new plants sprouting from the aute‘s root system. I promise myself that this time I will look after them better and have more and better bark for harvesting next time. 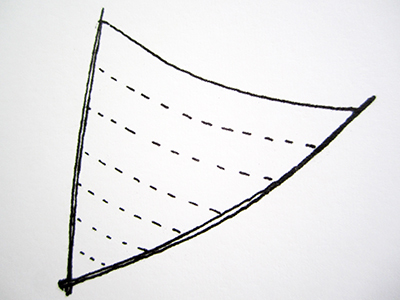 For my new project, I will have to use, yet again, tapa which I have imported for the purpose. While conducting my experiments, I have also been researching the Edna’s background. I want to know more about her history, however there is not much that can be found on the Internet. The Edna’s last captain, the late Nancy Griffith, lived in Hawaii. 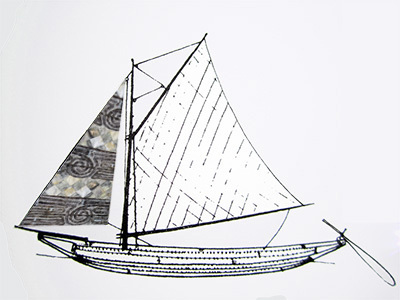 My artist friend Judith Kunzlé lived on Rarotonga when the Edna sailed Cook Islands waters and knew Nancy. Judith recently moved to Hawaii. 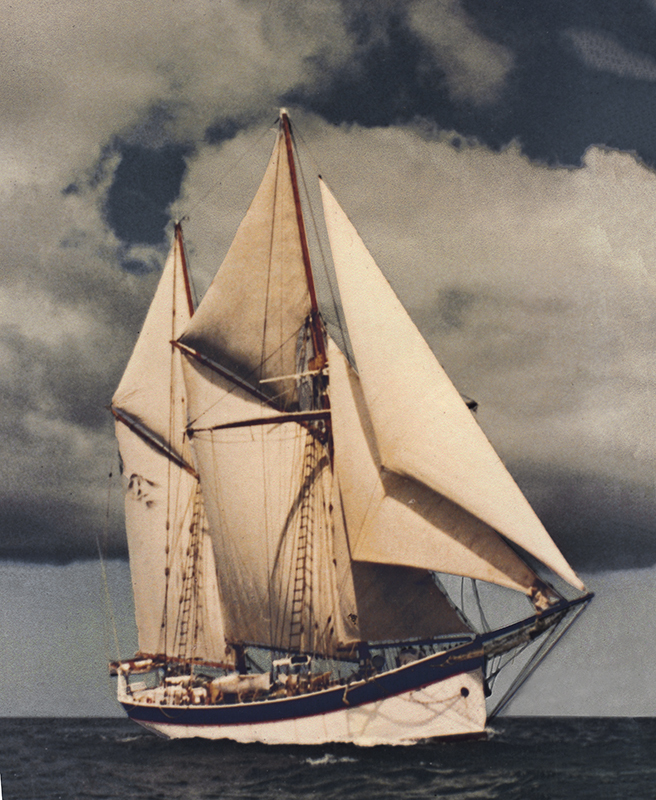 Today she sent me a copy of Nancy’s stunning photograph of the Edna in full sail. Isn’t she beautiful? If any of you, readers of my blog, has any information or photographs on MS Edna and her history, I’d much appreciate to hear from you. 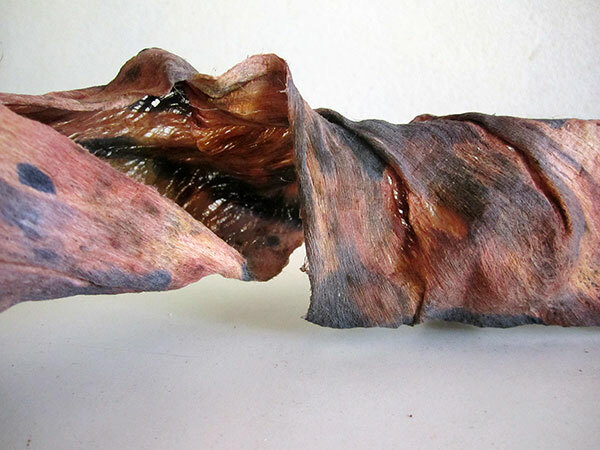 I have brought a new piece of Banyan bark, this time only just beaten to become flexible enough to wrap it around the magic frame. 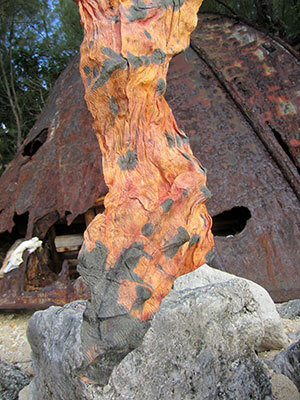 Like the previous piece, as soon as I wrap the bark around the metal, the blackening process begins. I love that magic! 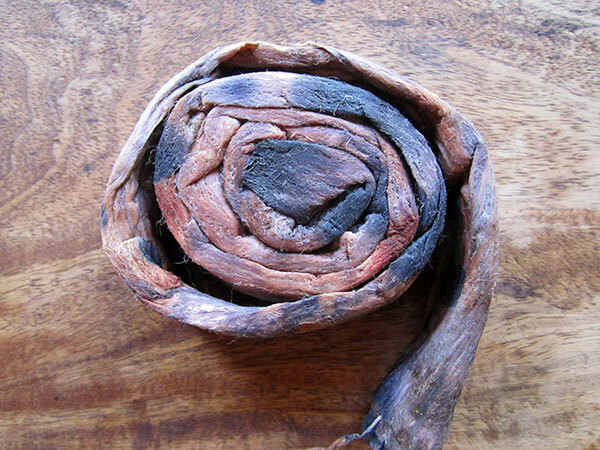 I have also wrapped a piece of eucalyptus-dyed gauze on the outside, part of which just sits on the metal, the other part covering the tapa. 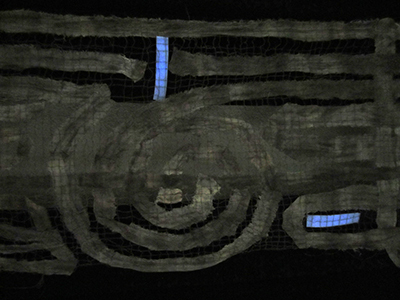 I want to find out, whether the area that covers the tapa will be dyed a different colour, i.e. whether the tapa’s own ‘juice’ leaves a trace. The weather is not so wonderful and I’m in a hurry, so I just drive to the beach and bring the frame back to unwrap at home. What I find is quite photogenic. 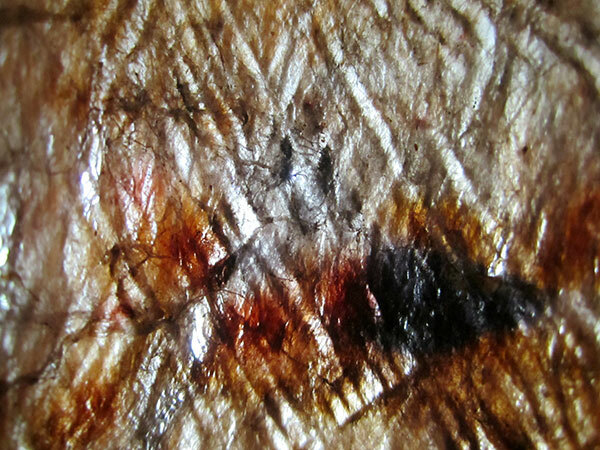 Yes, the tapa has added some brown colour to my gauze. Where it has just touched the metal it is only a mottled gray. 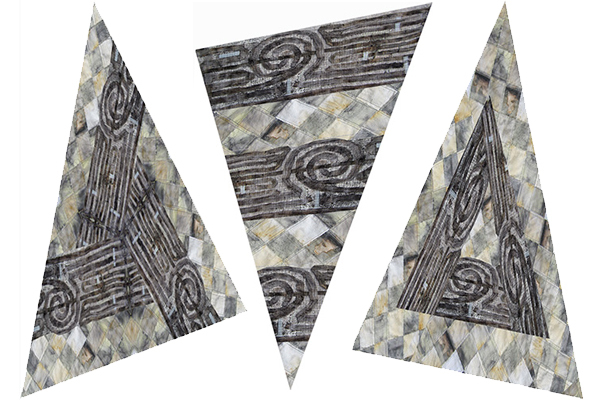 I fold the strip lengthwise and beat it, beat it, beat it, unfold and refold it and keep beating some more until I run the risk of ripping it with the next beats. Only then am I satisfied. 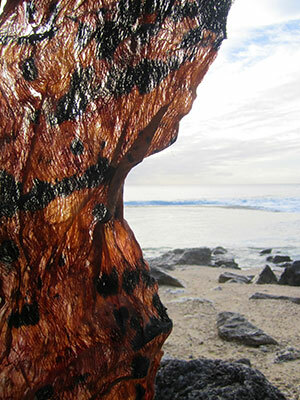 In its wet state, the tapa’s colours are rich; they will fade a bit as the bark dries. 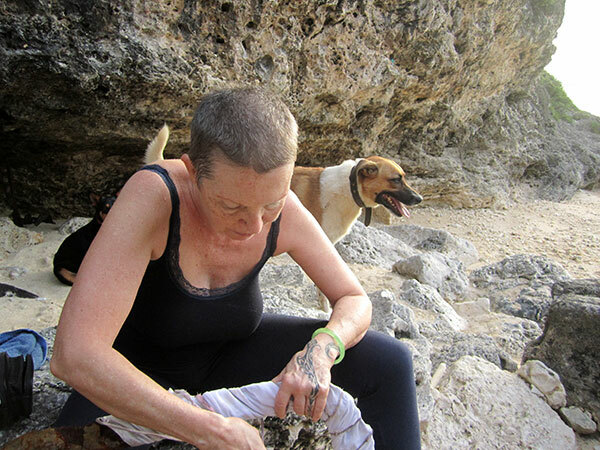 Excited and curious, Kareen and I return to Ava Tapu beach. Will the frame still be there? I don’t really feel like digging it out of the sand again. I would be sad to have lost such a valuable piece of rust. Does that sound strange? One (wo)man’s trash is this rust dyer’s treasure… As we descend I am relieved to see the boomerang-like shape of the frame still stuck in Edna’s bow. The bark has dried and is stuck to the frame. Untying the knots in the builders line is a fiddly job. 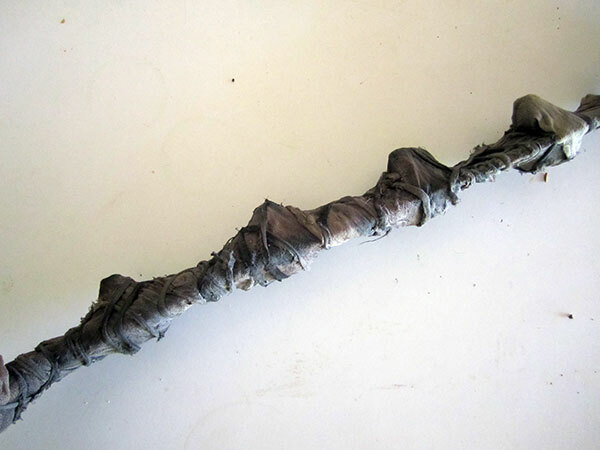 I carefully peel the thin bark off the rusty metal. The coloring is so wonderful, ranging from yellow to rusty-brown with black stains where the frame has made contact with the soaked bark. The frame’s protruding screws have moulded the bark and embossed their shape into the material. Do I really want to beat it again? I like the bizarre, flame-like shape the tapa has now. Held against the light we can appreciate how thin the bark is. It is firm and yet soft to the touch. 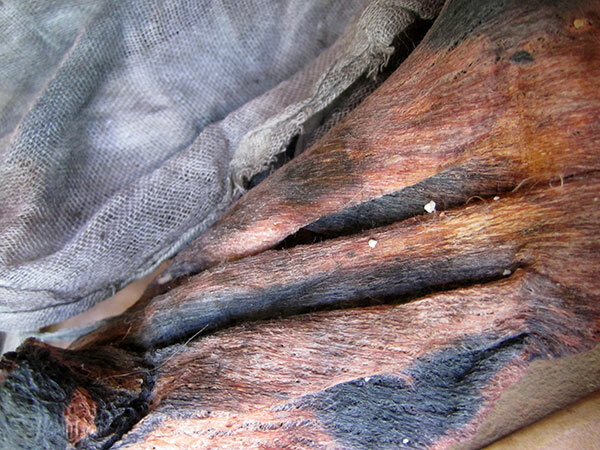 What must it have been like to wear such bark as a garment? Even the “dont-remove tape” has acquired new colours in all shades of the rainbow. The wash-away frame has become my favourite rusting tool. I wrap it with a new piece of cloth to have something to look forward to when I come back next time.